Paddle Tasmania will conduct the following courses at the Paddle Education Weekend at Forth, subject to water availability. Essential skills for safe paddling, suitable for beginner to intermediate paddlers, any type of kayak, to be held on the Forth estuary. Participants must have their own kayak and PFD (life jacket). Whitewater Skills – one day course developing whitewater paddling skills on Grade 2-3 water. Small group instruction from some of Tasmania’s best whitewater paddlers and qualified AC instructors. Saturday – Sunday, November 24-25 9am – 4 pm Paddle Australia accredited course for teaching skills and leading trips on flat water. Assessment options for: Flatwater Lifeguard, FW Guide or Instructor available. Paddle Australia training course for teaching skills and leading trips on moving water up to, and including, Grade 2 for experienced paddlers. 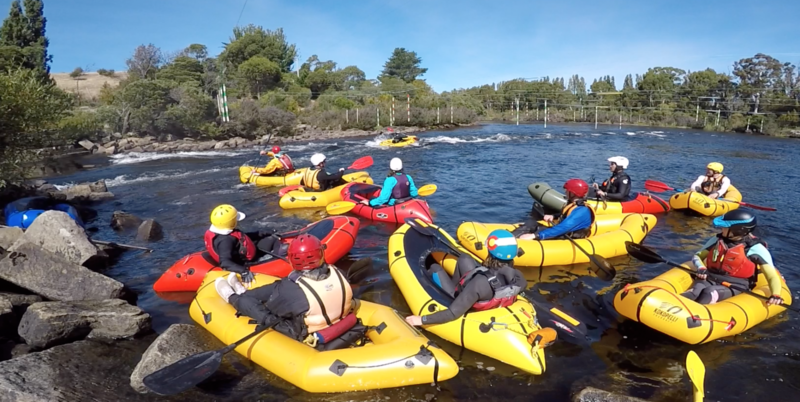 This training course is a strongly recommended pre-requisite for anyone wanting to go for the Australian Canoeing Whitewater Instructor Assessment at a future date (1.5 days assessment, separate). This is not an introduction to Whitewater Skills course (see above 1 day courses for Skills development), but for experienced paddlers looking at demonstrating correct stroke technique in an instructing situation on moving water, breaking down and teaching stroke technique, whitewater rescue techniques and the requirements for Whitewater Guide/Instructor Assessment. Assessment for the Paddle Australia Award of either Guide or Instructor for guiding/teaching skills and leading trips on moving water up to, and including, Grade 2. Two hour, whitewater skills sessions for students run by trainee whitewater instructors working under the supervision of AC qualified whitewater instructors and assessors. Note this only runs if there are enough participants going for an assessed qualification for WWG or WWI – contact Development Officer to confirm details.